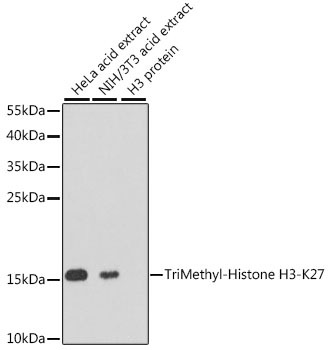 Dot-blot analysis of all sorts of methylation peptides using Histone H3K79me3 Polyclonal Antibody. Immunohistochemistry of paraffin-embedded rat brain tissue using Histone H3K79me3 Polyclonal Antibody at dilution of 1:200 (x400 lens). Immunohistochemistry of paraffin-embedded rat kidney tissue using Histone H3K79me3 Polyclonal Antibody at dilution of 1:200 (x400 lens). Immunohistochemistry of paraffin-embedded human lung cancer tissue using Histone H3K79me3 Polyclonal Antibody at dilution of 1:200 (x400 lens). Immunohistochemistry of paraffin-embedded human rectal cancer tissue using Histone H3K79me3 Polyclonal Antibody at dilution of 1:200 (x400 lens). Immunofluorescence analysis of 293T cell using Histone H3K79me3 Polyclonal Antibody. Blue: DAPI for nuclear staining. Chromatin immunoprecipitation analysis extracts of 293 cell line, using Histone H3K79me3 Polyclonal Antibody and rabbit IgG. The amount of immunoprecipitated DNA was checked by quantitative PCR. Histogram was constructed by the ratios of the immunoprecipitated DNA to the input. Histone H3K79me3 (H3K79 Trimethyl) Polyclonal Antibody. Unconjugated. Raised in: Rabbit. Liu Y et. al. (October 2018). Nuclear lactate dehydrogenase A senses ROS to produce α-hydroxybutyrate for HPV-induced cervical tumor growth. Nat Commun. 9(1):4429. Kang JY et. al. (May 2018). KDM2B is a histone H3K79 demethylase and induces transcriptional repression via sirtuin-1-mediated chromatin silencing. FASEB J. :fj201800242R. Mohan RD et. al. (February 2014). Loss of Drosophila Ataxin-7, a SAGA subunit, reduces H2B ubiquitination and leads to neural and retinal degeneration. Genes Dev. 28(3):259-72.